Janet Bostwick (Janet E. Bostwick, PC) discusses her experience volunteering for the M. Ellen Carpenter Financial Literacy Program with new volunteers. Volunteers braved the pouring rain on Tuesday night to attend the annual M. Ellen Carpenter Financial Literacy Program Training. Judge Joan Feeney (U.S. Bankruptcy Court and Jeanne Darcey (Sullivan & Worcester LLP) joined ), Janet Bostwick to walk the packed room through the volunteer materials and discussed tips for engaging high school students. As you may have heard from this article, 15 schools have signed up for the program, which means one thing—we need lots of volunteers. Are you interested in volunteering? Click here to view the available sessions. BBA Interns help staff the LRS booth at the 9th Annual MA Conference For Women. 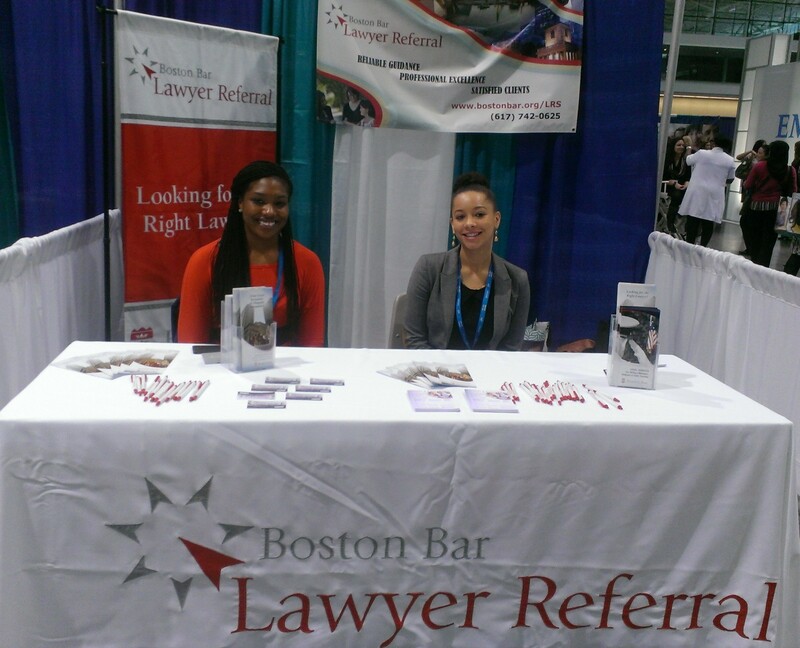 Last Thursday, the BBA Lawyer Referral Service (LRS) staff set up shop at the 9th Annual Massachusetts Conference for Women, which drew more than 10,000 women from across the state and New England. This year’s conference, held at the Boston Convention & Exhibition Center featured keynote addresses and breakout sessions led by more than one hundred experts in the fields of business, philanthropy, finance, media and professional development. The theme the conference was “The Power of Us,” and gave conference attendees many opportunities for business networking, professional development and personal growth. Hundreds of attendees stopped by the BBA’s booth, inquiring as to how they could receive referrals through the Lawyer Referral Service, and about the BBA’s Mission and role in the community. The Massachusetts Conference for Women is the largest outreach and marketing event of the year for the BBA LRS, who participates in approximately 10 outreach events yearly. Next on the calendar is the 26th Annual Quincy Lunar New Year Festival in February. Stay tuned for more details! The panel discussed some of the challenges that veterans face veterans when they return from the service. Last Thursday, the BBA hosted the final training in the CLE series on Representing Military Personnel and Families. Even though this training series has concluded, the BBA’s commitment to helping veterans and military personnel with the legal challenges that they face is far from over. With the adoption of the Military Legal Help Line and the BBA’s involvement in the Yellow Ribbon Project and the Massachusetts “Stand Down” event, the BBA’s support of this initiative will continue. To encapsulate why it is important for the BBA and lawyers as a community to give back to veterans, military personnel and their families, check last week’s responses to Voices of the Bar. Keep an eye on the BBA calendar for additional training opportunities this winter and into the spring. If you would like to know more about joining the Military and Veterans’ Panels for the Military Legal Help Line, please contact Solana Goss at sgoss@bostonbar.org. This past Saturday, a group of New Lawyers spent the morning volunteering at Cradles to Crayons in Brighton. For those of you who are not familiar with the organization, Cradles to Crayons provides essential items like clothes, shoes, books and school supplies, for children who are homeless or living in low-income situations with the help of volunteers. During their shift, the BBA volunteers inspected donated books and sorted them into categories based on gender and age group, which helped provide books for 85 kids, ages 12 and under. This opportunity, along with the recent Franklin Park Clean Up and Food Project events, allows New Lawyers with busy schedules a way to positively impact their local community while meeting other Boston-area attorneys. If you’re a new attorney interested in socializing and giving back, be sure to check out the New Lawyers Section’s Holiday Extravaganza on December 5th where you can donate items to Toys for Tots. Click here for more information. Beyond the Billable congratulates PILP 9 for a job well done and encourages readers to stay tuned for more updates on this initiative. Contact Susan Helm at shelm@bostonbar.org with questions on PILP.